A plan showing the remainder of Erf 5131, which is about 4 to 5ha, which SANParks sold to the City of Cape Town in 2004 specifically for expansion of Masiphumelele, yet community leaders say the City told them the land was owned by SANParks and thus they could not allow development on it. The yellow blocks indicate the planned Phase 4 housing development which covers only a portion of the City owned land. Contrary to claims there is no land for development in Masiphumelele, where a devastating fire left two dead and over 4 000 people homeless in November, the City has owned land next to the township for over ten years. And while 259 children, women and men have been cramming in the community hall for seven weeks, the City told them there’s no land for them to move onto because all the surrounding land was owned by SANParks. But SANParks sold them the land next to the township ten years ago. Following the fire on November 29, the City has reblocked the affected Sections D and E in Masiphumelele informal settlement and provided building materials for the affected families. However, due to the reblocking which ensures shacks are built at least three metres apart and roads are provided for emergency vehicle access, not all the affected families are able to fit back on the available land. As a result, seven weeks since the blaze, there are still 259 women, children and men sleeping in the community hall, says co-director of Hokisa Children’s Home in Masiphumelele, Lutz van Dijk. Their is only one toilet for those living in the community hall, no shower and no kitchen facilities, says van Dijk. He said the reason hundereds of people were still homeless was because only “validated fire victims, those who had owned a shack before”, were allowed to rebuild while all the people who rented a room or a shack were discounted. He said ward councillor Felicity Purchase called these people “illegal” and the City has claimed Masiphumelele cannot expand because it borders wetlands and land owned by Table Mountain National Park. But community leaders have discovered that land next to the existing informal settlement is not owned by SANParks, but by the City itself. Speaking at a meeting at the community hall on Tuesday evening, community leader Tsepho Moletsana said because the City had told them the land surrounding the township was owned by SANParks, they requested a meeting with the national park officials. In that meeting, said Moletsana, the first of which occurred on January 8, national park officials told them they sold land next to Masiphumelele to the City in 2006. He said SANParks suggested a follow up meeting with City mayco member for housing Benedicta van Minnen and mayco member for planning, Johannes van der Merwe. Moletsana said van Minnen did not deny the City owned the land but said SANParks had told let the City by it on the condition it be kept as a “buffer zone” between the settlement and the wetlands. However, Moletsana said, the land was now covered with alien Port Jackson bushes, which he said van Minnen did not deny, and that SANParks told him it did not benefit the environmental health of the wetlands in any way. Park manager of Table Mountain National Park, Paddy Gordon, said the land, which is 10.8ha, was sold to the City of Cape Town for R1.5m in 2004. Gordon said rather than expecting the City to keep the land as a buffer zone for the wetlands, the portion of land was made available by SANParks to the City “to accommodate Masiphumelele development pressure which SANParks anticipated”. Yet, rather than being developed, residents living in shacks on the current boundary of Masiphumelele have been prevented from moving onto the adjacent land. Van Minnen said it was “common knowledge” that the City owned erf 5131, contrary to statements by community leaders, and said the Masiphumelele Phase 4 housing project was to be developed on the land. Van Minnen said the beneficiaries of this housing development had “been identified in line with the City’s beneficiary selection process and through a public participation process that has taken place over many years”. 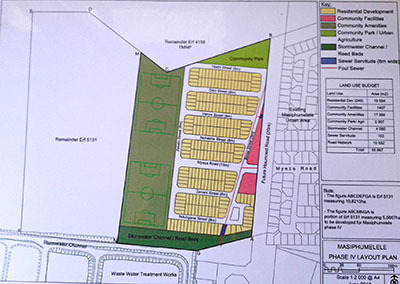 However, the Phase 4 housing project is situated only on a portion of the land, with 4ha to 5ha still vacant on the erf, an issue van Minnen did not address and community leaders say they were led to believe the vacant land, which is on the other side of existing sports field, was owned by SANParks, which is why they approached SANParks officials in the first place. But Horst Kleinschmidt, who runs the Ubumelwane organisation which organises surrounding neighbourhoods to assist Masiphumelele residents, said Phase 4 housing project did not address the hundreds of people who remained homeless due to the fire as they were not necessarily pre-selected beneficiaries of the housing project. Van Minnen also claimed only 82 people were currently staying in the community hall, not 259 as van Dijk counted. But Kleinschmidt said the City counted the number of people in the hall during the day while people were at work or finding recreation elsewhere. He said van Dijk had been to the hall at night on a number of occasions and counted the people sleeping there. Van Minnen said the City had provided humanitarian relief to the “82 residents” accommodated in the halls, “including food”. “They also have access to water and sanitation,” she said. However, water and sanitation, says Dr Peter Jacka, who is the only general practitioner in Masiphumelele and has practised there for 15 years, consists of one toilet. Jacka said from a health perspective, crowding over 250 people in a community hall for seven weeks was “unacceptable”. He said any contagious diseases, such as chickenpox, would spread like wildfire in the hall and there was also the danger of entiritus (severe diahorreah) which was not contagious but spread easily when there was a lack of hygienic facilities, such as everyone using a single toilet.